If you fourwheel with any frequency, you'll eventually find out that you need to air down your tires in order to increase your traction. Aired down tires give you a bigger contact patch and more tire tread contact with the ground. We'll show you the best in tire deflators, then some cheap ways to do the same thing. When you air down, the amount of tire that contacts the ground is increased. Aired-down tires conform to the shape of the ground more than fully inflated tires and have a much larger contact patch. This works everywhere - rocks, sand, mud, snow. It's better to air down before you get into trouble, although often you can still save yourself by airing down if you aren't in too deep. The act of airing down your tires can be time consuming and tedious. 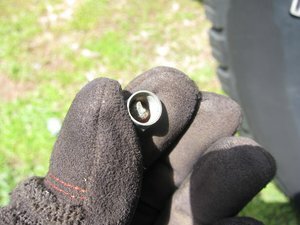 You might have done this before with a key or the tip of a pen, holding one of them against the valve core for a few minutes on each tire until your tires have a bulge. It's not really fun to kneel and carefully push in the valve core, and it's even less fun when it's muddy and cold. Large tires can take a long time to deflate. And that's where tire deflators come in. If you fourwheel with any frequency, use one of the following methods to air down your tires more quickly and consistently. Below we have the gold standard for tire deflation, then three cheaper options that'll work in a pinch. The best, most trusted, and most well known tire deflators. First up is the Staun Tire Deflators. These tire deflators are the gold standard in the 4x4 world and Staun has been producing them for a long, long time. 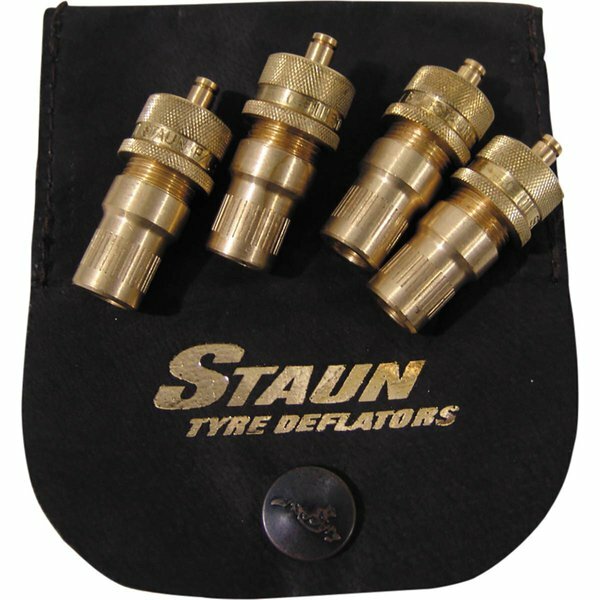 Staun has a stellar reputation and their tire deflators have proven themselves around the world in rocks, mud, sand, and snow for daily drivers, comp rigs, and expedition rigs. These deflators can deflate to a set-and-forget range of 6-30 psi. This means that you can set each tire deflator to your desired tire pressure once and the deflator will stop deflating at that pressure. The high quality means that your tires will consistently stop airing down at your chosen pressure - not at ±1-2 psi as with some other manufacturers.They come factory preset at 18 psi. The Stauns are machined from brass, made in Australia, and come with a leather case. This chuck could be used to air down alone, or up with a compressor and a hose. These are $2-3 or so. 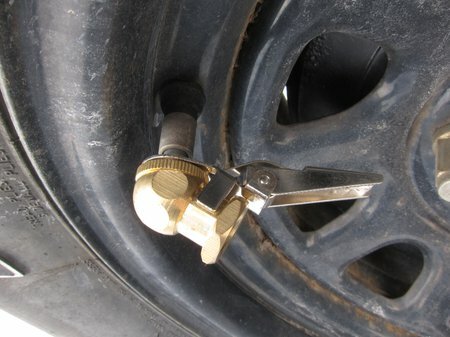 Pull the lever back, clip it on, and wait till your desired tire air pressure is reached. You can buy clip-on air chucks for $2-3 from places like Harbor Freight. We found some slightly more expensive clip-on air chucks on Amazon that would also work. 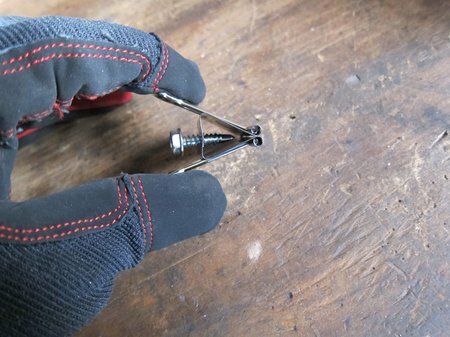 They work great because they’ll attach to your valve stem with the clip so you aren't holding anything in place by hand, like a screwdriver or a key. If you upgrade to onboard air in the future, you can also attach the air chucks to a split air hose to fill up more than one tire at a time. 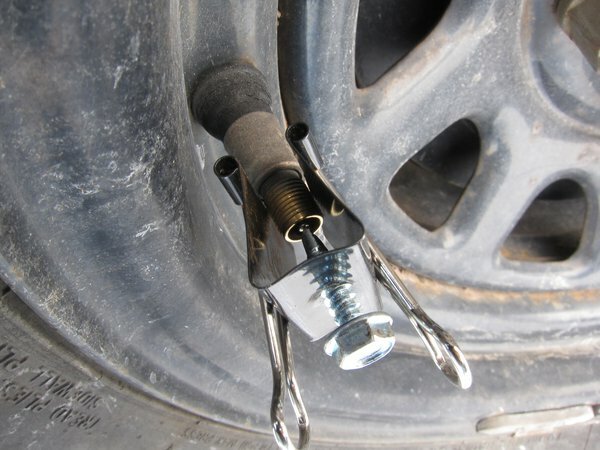 All you do is clip on the chuck and wait till the tire is at your intended air pressure. 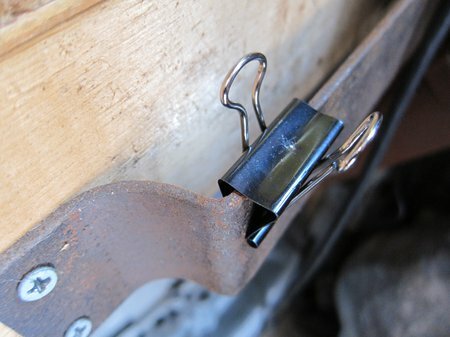 You might actually have binder clips and screws laying around, so this is something you could whip together right now. A really easy solution is a self-tapping sheetmetal screw that will drill your hole for you. You can make four of these practically for free within 10 minutes or less. 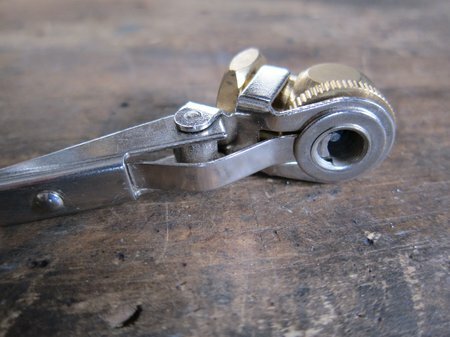 Drill a hole in the binder clip, twist in the screw, and clamp it on the valve stem. Air comes out and it’s almost free! And if you ever lose one, who cares? When you drill the binder clip use a sharp drill bit. 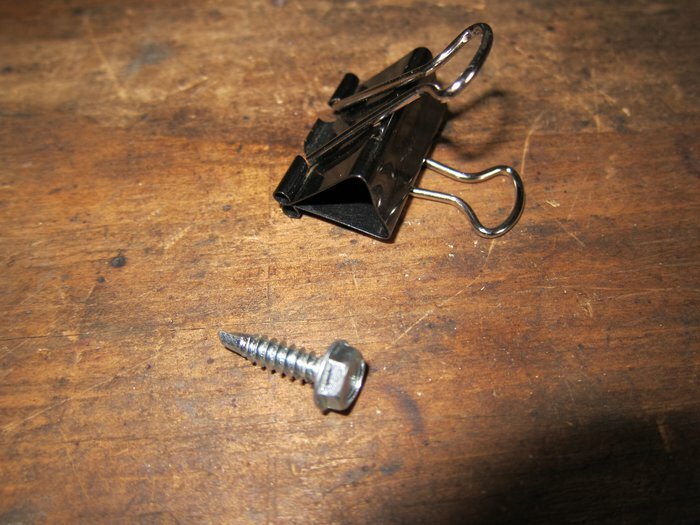 It's likely that the sheetmetal screw won't be able to start the hole in the binder clip, so you'll have to pre-drill. We used a #10 screw, 3/4" long, since we had them laying around. 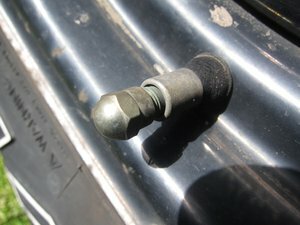 The screw stickout works well for pushing in the valve core. The sheetmetal screw pushes the valve core in. Wait until your tires are aired down and pull it off. This is the cheapest of all - free! 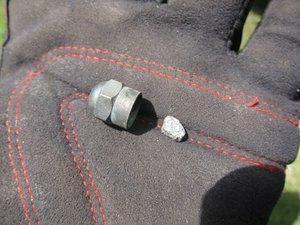 Find a little rock that will fit in your valve cap, put it in your valve cap, and twist your valve cap on until you hear air escaping. You need the right sized rock for this, but that shouldn’t be hard to find. As a side note, little kids in some third world countries like to “air down” your tires for you sometimes using this method. So if you’re renting a car and you have a flat, check the valve cap for a pebble before you assume you have a hole in the tire. ...twist the valve cap on until air comes out. Compared to the Staun tire deflators, our cheaper options are not quite as full featured -they aren't precise, and won't stop at a predefined tire pressure. And they have no bling! Here's how to get the most from them. ...then you should take them off in the exact same order. Generally this means that you can just check the first tire, and once it hits your desired tire pressure, you can take off all the deflators in order. Time how long it takes you to air down from your normal street pressure to your fourwheeling pressure. Since it'll be the same every time when going between each pressure you can just set up a timer and pull of the deflators when your timer goes off. You should still do a quick tire pressure check to make sure everything is okay.